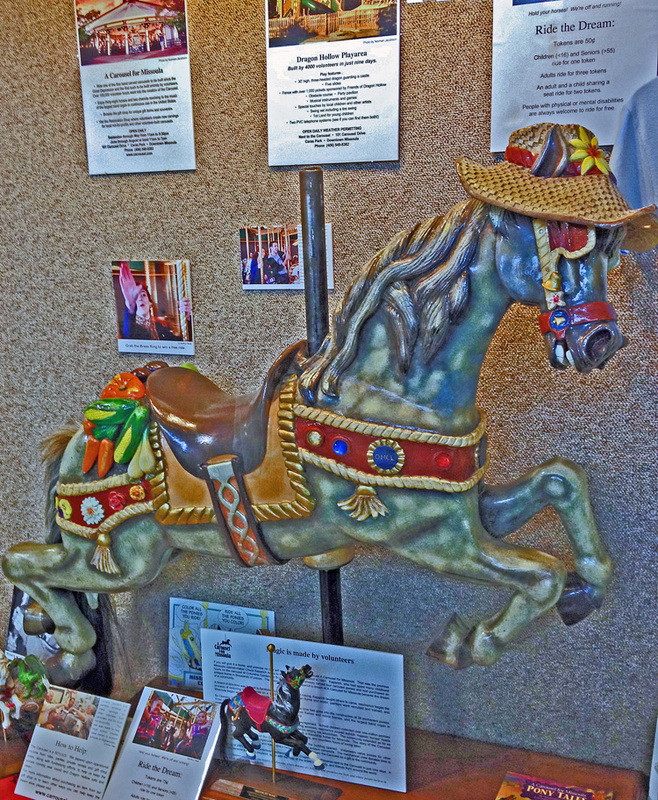 MSO Display — A Carousel for Missoula, hand crafted merry-go-round pony. Small airports are often a delight; it’s so easy to get around, people seem for friendly and tuned in to each other. At the MSO airport even the security agents were chatty–talking about upcoming changes to the boarding procedures. As I rolled my bag into the Missoula airport entry, I came across a large display case with a full-size carousel pony tucked inside. Chuck Kaparich, a local wood-carver and cabinet-maker, started a project, “A Carousel for Missoula“, to bring a historical carousel to Missoula, and he succeeded. The carousel was originally built in 1918 by the Alan Herschell-Spillman Co. and features hand carved ponies and other animals.The carousel is open every summer; I missed it this time, but will be sure to check it out if I pass through again. Detail of “Sunnyside Up” by Harry Koyama of Billings, MT. On the other side of the display case an artist dressed in frontier style leggings and cowboy gear was setting up a display of his art. His name was Harry Koyama. His dramatic paintings of wildlife and mountain scenes decorate the Depot Bar and Restaurant where we ate the last night of vacation. 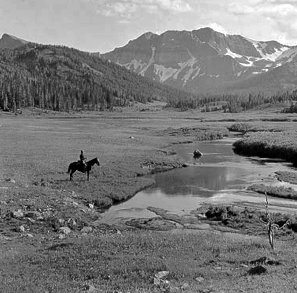 Photo, K. D. Swan, 1938 from Wild Montana Photo Gallery, Sierra Club. Kenneth Dupee Swan (1889-1970) photographed the Northwest in the early part of the 20th century. During his career with the USDA Forest Service from 1911 to 1947, he captured the face of public lands, revealing their wildness and value to the American public. A retrospective of Swan’s art is also on display at the airport. Missoula International, a pleasant place to spend an hour waiting for a flight to San Francisco. 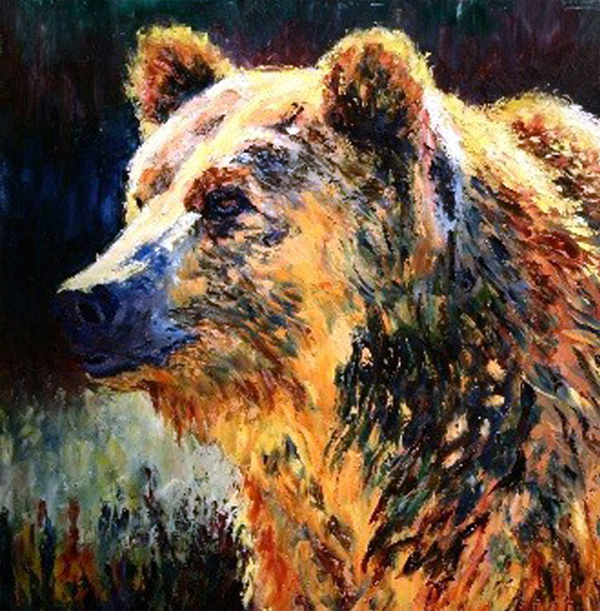 This entry was posted in Montana, Travel Blog and tagged Carousel, Harry Koyama, iPhone, K. D. Swan, Missoula, Travel, Vacation by carto. Bookmark the permalink.